The Episcopal Church in Porter County had its roots in several small earlier congregations. In the early 1860’s there was a small number of Episcopalians in Porter County who held twice-monthly services. This group, named the Church of the Holy Communion, struggled to survive. Changes caused by the Civil War ended the group. In 1864, a group of German Lutherans left their own denomination for the Episcopal Church. They too called themselves the Church of the Holy Communion. Their rector, Wilhelm Jahn, held worship services in German for some 200 communicants in space rented from Valparaiso University. Father Jahn took a trip out West to raise funds to build a church for the new congregation. Sadly, Father Jahn was “shot in a guerilla raid [meaning by combatants in the Civil War] while riding on the north Missouri Railroad” according to a report published in the American Quarterly Review in 1865. After Father Jahn was killed, another German-speaking rector was assigned to the Valparaiso church. By 1867, however, the congregation was, once again, no longer affiliated with the Episcopal Church. In the 1880’s, according to Claribel Dodd Smith, whose family moved from New England to Porter County, Episcopal services were held in private homes in Valparaiso. Whether members from the earlier congregations attended is not made clear. The celebrant, Father Moore, would pick up worshipers in his sleigh for services in winter. In the 1890’s, services were held in larger venues – at one time at Moltz’s jewelry store, across from the Courthouse on Lincolnway, and, at a later period, above a hardware store. By 1900, this group had grown and was granted the status of a mission church under the name St. Andrew’s. (A church has the status of mission church if it is dependent on the diocese for some part of its funding.) St Andrew’s built a church in 1902 on Erie Street in downtown Valparaiso. In 1939, a group of monks from the Order of St. Benedict in the Anglican Communion arrived in America from England. These monks came to St. Andrew’s and were in charge of the church until they built their own monastery in Three Rivers, Michigan, in 1946. Our church’s history is enriched by having been the first home of the American Anglican Benedictines. 1950 was the 50th anniversary of St. Andrew’s. A large celebration was held on St. Andrew’s Day (November 30) to celebrate. The church was able to advance from mission to parish status in 1960One of the notable rectors who served St. Andrew’s during its second 50 years was Father Samuel Elliot (1946-1951). It was Father Elliot who located the small stained-glass windows that were originally in our old church and that were moved and installed in our new church in 2005. Fr. Forrest Clark (1954-1969) was a beloved rector. Despite ill health, Fr. Clark agreed to serve again as a priest at St. Andrew’s even after his retirement in 1969. From 1973-1977, Fr. Clark served St. Andrew’s without pay and saw the congregation through a difficult time. Father Clark’s widow, Canon Kitty Clark, is still involved with St. Andrew’s and is in contact with our congregation. Fr. 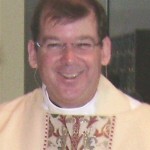 Ross Mack (1977-1984) is still a member of St. Andrew’s and serves occasionally as a supply priest. 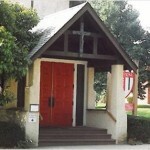 Father Mack began a long process of repairing Old St. Andrew’s and oversaw the building of the attached Parish Center. Fr. Patrick Ormos (1991-2007) led the parish during a period of growth. 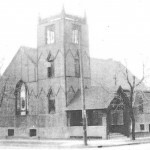 During his time at St. Andrew’s, the congregation outgrew the church on Erie Street. We moved to our new location on Bullseye Lake Road in 2005. Fr. Roger Bower has been our permanent Priest since January 2010.